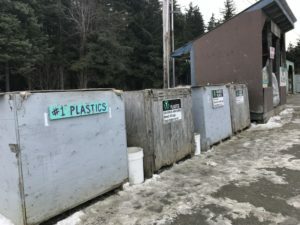 The community of Haines is already doing a lot to promote less waste, but this Earth Day a recycling organization in the Southeast Alaska town is trying to take it to a whole new level. And with high prices at the landfill, the community of 2,500 has a big incentive to throw less away. Every couple of months, Kelly Mitchell hauls boxes and bags full of cans, paper and plastic in the back of her station wagon to the recycling center in Haines. “This is probably my biggest one— I make a lot of paper trash,” Mitchell said as she dumped her paper waste into a large bin at the center. It has become part of Mitchell’s routine. “I’m kind of a rabid sorter, I pre-sort at home,” Mitchell said. Mitchell is one of many in Haines who rely on the center. In 2017, the center shipped out nearly 300,000 pounds of recyclables, with support from community memberships and donations. The center is run by Haines Friends of Recycling, which started in 1999. It also takes larger items such as appliances for a fee. Like Mitchell, Genny Rietze is an avid recycler. “We’re using reusable bags, we’re using reusable food storage,” Rietze said. 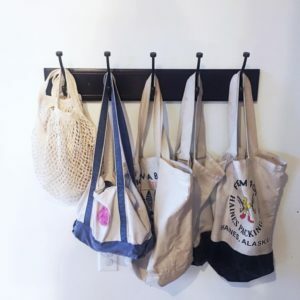 On a shelf in her hallway at her home, are stainless steel water bottles and coffee mugs that she picked up from a second-hand store, alongside canvas reusable shopping bags hanging from hooks. But lately, Rietze has been trying something new. “A big thing we’re doing is composting,” Rietze said. Simplifying life through setting up her household with more reusable items along with some other changes. One big change Rietze made at her house in order to throw away less, was simply not using paper towels. Instead, she bought flannel, washable, reusable napkins. “We still have this one roll of paper towels that we’ve had for a year, just for people that need it when they come over, but the cloth napkins are really all you need,” Rietze said. Rietze was inspired by best-selling author, Bea Johnson who explains in her Ted Talk how to reduce your overall household waste. 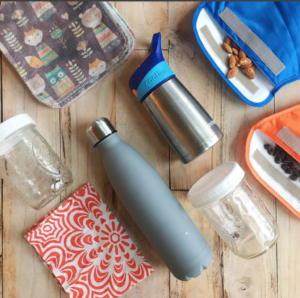 “For my family, zero waste is not about recycling more, it’s actually about recycling less by preventing waste from coming into our home in the first place,” Johnson said. Johnson speaks all over the globe about the idea of zero waste, which she has applied to her own home and outlines in her book, Zero Waste Home. According to Johnson, there is also an economic benefit. Johnson claims that her household cut their overall budget by 40 percent through the changes. And that is an exciting prospect in Haines where it is expensive to throw stuff away. If you haul it yourself, it costs 27 cents per pound to dispose of garbage at the landfill, a privately-owned company: Community Waste Solutions. Pick up of one can weekly, curbside costs $68 per month. Aronson said recycling is important, but she hopes more people in Haines will begin to reduce their household waste-streams altogether. “Everything that we can do to reduce that waste-stream keeps things out of the landfill keeps things from having to be shipped out to maybe a landfill, someplace else,” Aronson said. As for Mitchell, who spent much of a recent Saturday morning at the recycling center, she says she hauls all that aluminum, paper and plastic around, for future generations. “I don’t have any kids, but I feel like it is important not to fill up the earth with trash,” Mitchell said. A way of thinking that people at Haines Friends of Recycling, hope just keeps on growing in Haines. Haines Friends of Recycling and Haines Packing will host Bea Johnson for a talk about her book, Zero Waste Home, on Friday, April 13, 5:30-7pm at the Chilkat Center for the Arts. There is a charge of $10 online or $15 at the door. Proceeds support Haines Friends of Recycling Earth Day activities.